A few months ago I was at a keynote speech given by a famous photographer and workshop leader (you’d know him). He had a lot of great advice to give, but one thing that he said still bugs me. He told us a story about one of his students who, at the end of a wildlife workshop, exclaimed that he’d captured over 8,000 images. In his keynote speech, this famous photographer laughed at his student for shooting so much, since he himself had only shot 800 images. I never like it when a workshop leader pokes fun at his students but, as he explained further, his reason for telling us the story was a pretty good one. As a workshop leader he would always set a daily goal. He would decide ahead of time what he wanted to capture and then he’d focus on making those images. He coached his students to work that way too. I love the idea of setting a goal and having a vision. Setting goals is part of how we improve our photography. 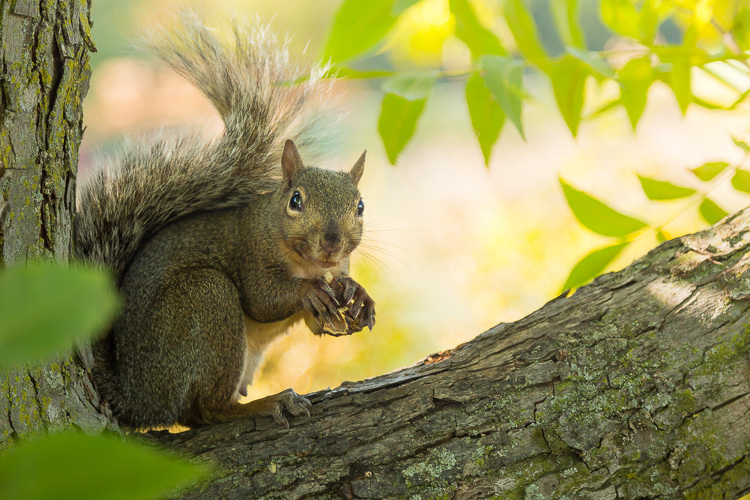 Every fall the squirrels descend upon my backyard tree and gorge themselves on nuts. During this time of year, I stealthily make images of the little rascals. I don’t shoot aimlessly when I work on this project. My on-going goal is to capture soft golden light, creamy blurred backgrounds, sharply focused eyes and engaging expressions. 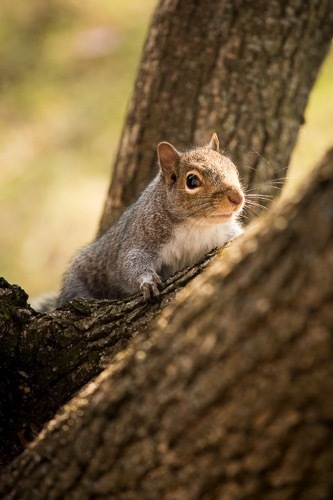 Squirrels move fast and I’m neither as speedy nor as stealthy as I’d like to be. I shoot a lot of frames when I work on this project. You knew there was a but, right? The singular vision of this workshop photographer might not work for all of his students. As great a teacher as he is, the first morning you head out together, you probably won’t have enough information to have an instant vision of the work you want to make during the workshop. You might even struggle as you climb the steep learning curve of wildlife photography – and you may shoot a lot as you learn. Plus, shooting with a goal doesn’t equate to less shutter clicks, it equates to more focus. You might need even more shutter clicks than you usually do, depending on the goal you’ve set yourself. This big cat, photographed at Lincoln Park Zoo in Chicago, is one of the few images I’ve made there that I’ve been pleased with. Most of my images from the zoo don’t fulfill my vision. This one does because the she-lion is engaging with another lion (out of the frame). Her eyes are sharply focused and the background is not only blurred, but it frames her beautifully, and emphasizes her coloring. 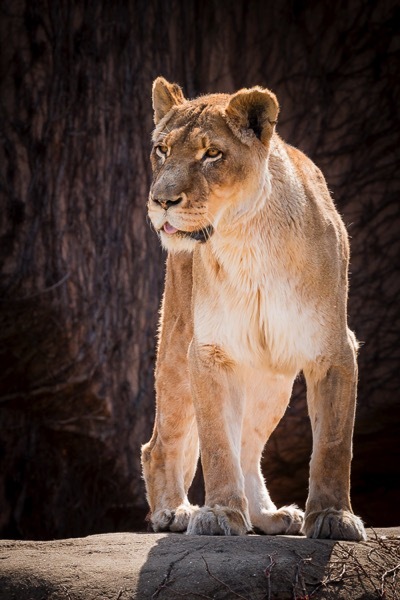 I easily shot several hundred images of this lion one afternoon, to get this single image. 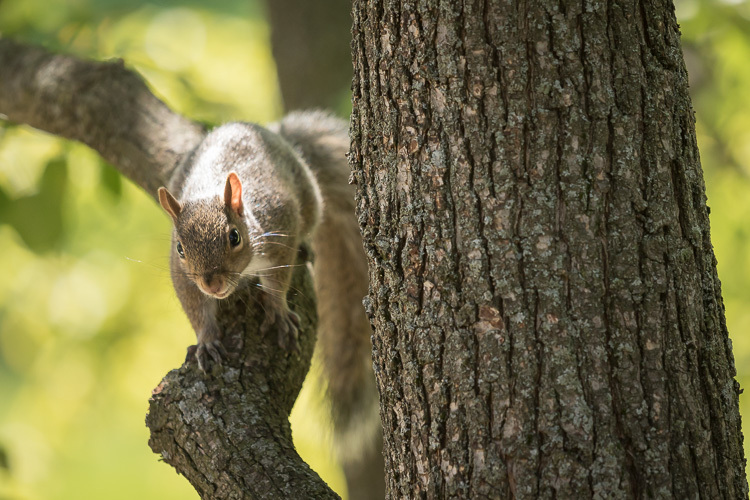 Shooting my backyard squirrel project helped me define a vision of how I wanted this image to look, but it still took me a lot of frames to reach my goal. The way the keynote speaker made fun of his student for “over-shooting” bothers me because shooting wildlife images from inside a jeep or blind, elbow to elbow with four other workshop photographers, while steadying a super zoom lens, isn’t exactly easy stuff. Once you start to learn the technical aspects of this type of shooting, your authentic vision might kick in as early as Day 2 or 3 of your workshop. If it takes you all week to get comfortable with wildlife shooting techniques, your vision might not kick in until well after you get home. Personally, that delayed vision is why I encourage photographers to shoot with what I call the joyful abandon approach. I especially recommend the joyful abandon approach when you’re visiting somewhere you’ve never been, or learning to shoot in a new way. Imagine that you do finally fully develop your vision well after you’ve finished your wildlife workshop. Won’t you want a huge pool of images to ensure that you have the raw materials to realize your vision? I’ve traveled to Florida dozens of times but up until a few years ago, I’d never visited the Everglades, or ridden in an airboat. 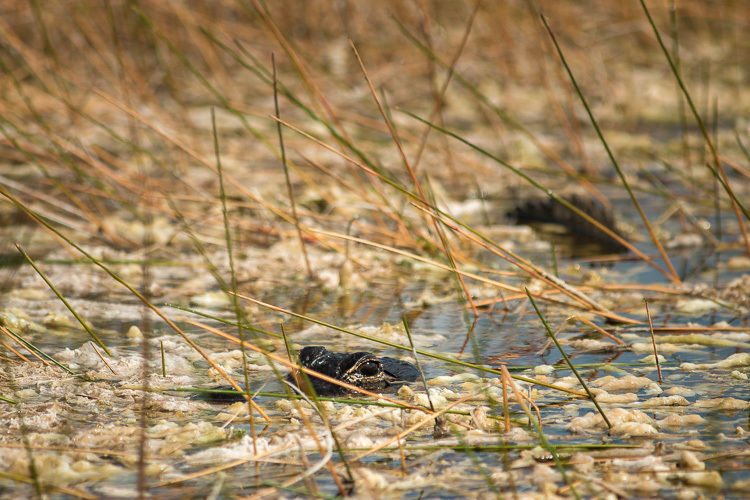 Even with an amazing guide explaining the ecosystem and gliding the boat slowly up to known alligator dens, it was a technically difficult shoot. With the movement of the boat and the reeds, my camera struggled to grab focus where I aimed. The result? I shot. And shot. And shot some more. I’m grateful for all that shooting, since this is the one image I walked away with (above). It has that blurred golden background I love and – key for me when I shoot wildlife – that engaged expression, and tack-sharp focus on the eye. You may never again have a chance to return to that wildlife workshop location, but your workshop leader does. He has the luxury of going annually with his students. He can take years to develop vision, shoot with measured patience, and build a portfolio of the 25 best wildlife images anyone has ever seen. You, on the other hand, should shamelessly fill memory cards so that when you arrive home, you have access to a massive database of images that might yield 200 shareable gems. It will take work to cull those images and get to those gems, but it’s worth it, isn’t it? Since your workshop leader has been on this type of shoot over and over, all that familiarity gives him increased comfort, and that increased comfort opens the portal for him to be more focused, and more creative, while shooting fewer frames. Plus, he already owns all of those classic wildlife images that you’ll still want to bring home. He has the luxury of pressing that shutter button once every 15 or 30 minutes. You don’t. You have work to do and a portfolio to build. 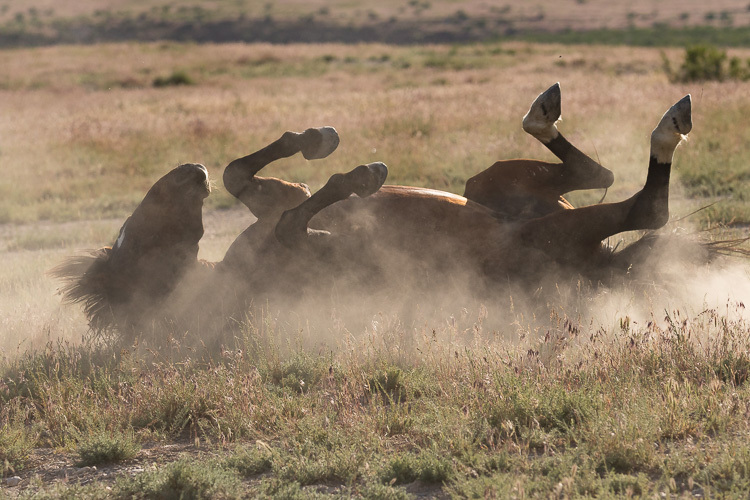 A wild horse rolling in dust is a classic, portfolio-building wildlife image. Over the years, I’ve easily shot a thousand frames of rolling horses, but for me, this is “the one.” The experience I’ve gained from shooting with joyful abandon taught me just where to stand and how to compose my image. To maximize the dust and light beams, while capturing all four legs in the air, a well-defined face, and a highlighted mane. 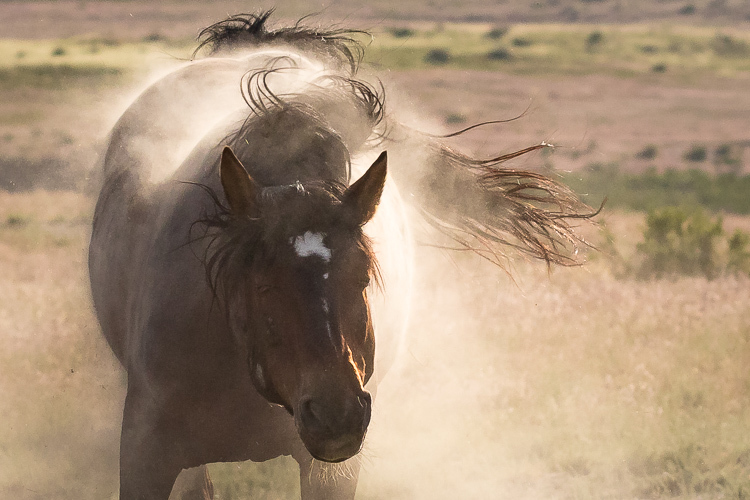 I continued to shoot as this horse lumbered back up to his feet and was rewarded with a glorious, dusty shake too. While I’m using a wildlife workshop as an example, since that was this keynote speaker’s specific remark, this idea of shooting with joyful abandon really applies to any opportunity to shoot, anywhere, even if you’re not on a workshop. 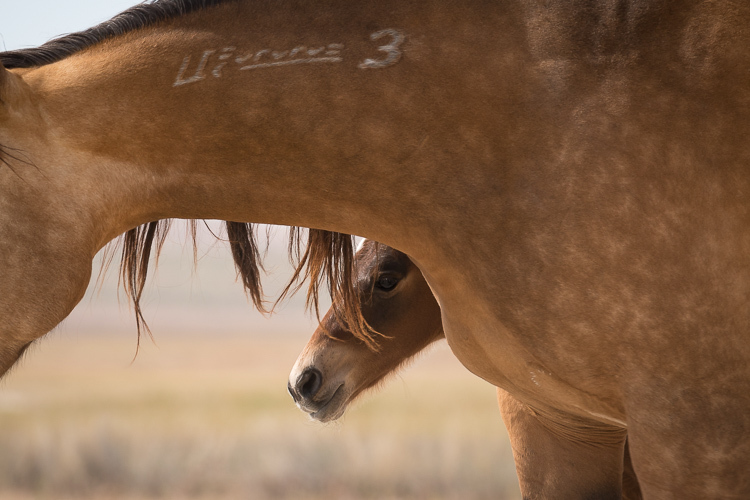 Whenever I travel to a new-to-me wild horse range, I carry massive amounts of memory cards and storage, and I shoot with absolute gleeful, joyful abandon. 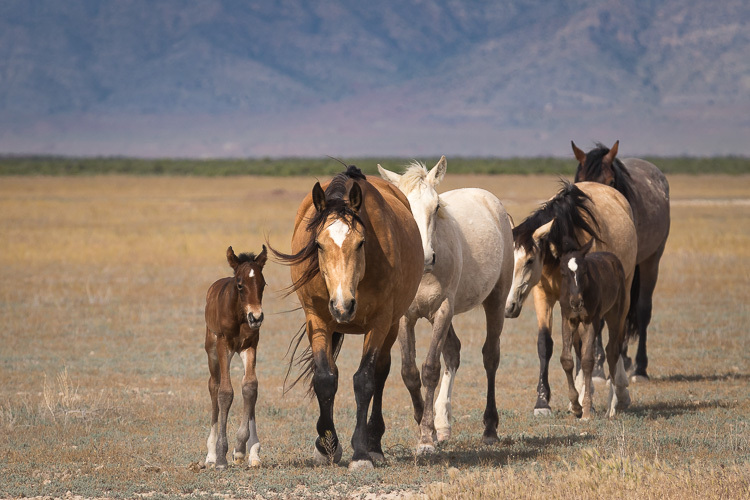 When I have a chance to return to that same wild horse range, I still have stacks of memory cards and storage, plus a more informed, authentic vision of the images I’d like to capture. I continue to shoot with joyful abandon and I promise you, over the course of a week, I’ll shoot far more than 800 frames. Making images isn’t just about how many frames we shoot, or how many keepers we get, it’s also about the process. Every single frame you shoot is part of your process, and that process helps you develop your unique vision. 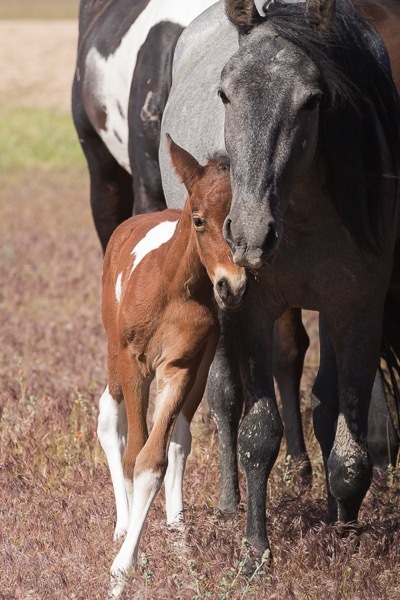 Whether that vision is focusing on the big picture or honing in on small details, or documenting grand moments or capturing subtle tender ones like these foals with their mothers, shooting with joyful abandon will help you achieve it. The shooting with joyful abandon approach is how I’ve developed my vision – and how I continue to develop it and stay passionate about shooting. How do you develop your vision and fuel your passion for photography? The post Why Shooting with the Joyful Abandon Approach Can Improve Your Photography by Lara Joy Brynildssen appeared first on Digital Photography School.